My love affair with cutting/bread boards continues! I buy them at thrift shops and garage sales all the time. Here is my latest one. 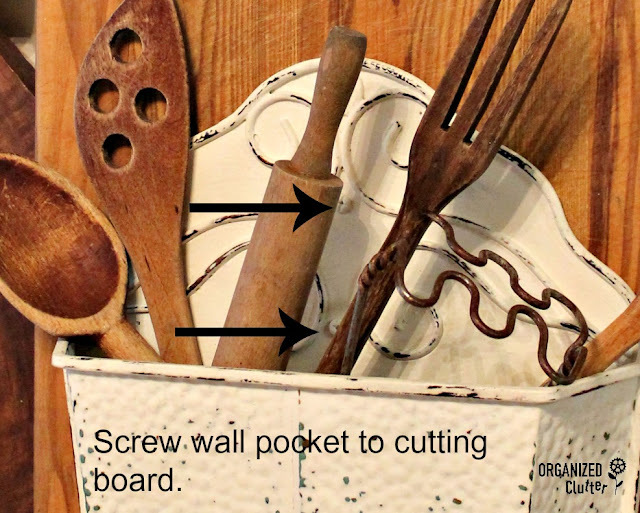 In addition to the cutting board, I purchased this metal wall pocket at the thrift store too. I painted the wall pocket with two coats of Annie Sloan Chalk Paint in Old White. I wet distressed the wall pocket with a damp rag, and then waxed it with ASCP clear wax. Next, I screwed the wall pocket from the front at the top and near the opening to the cutting board with two screws. I then filled the wall pocket with faux Christmas greenery and red berries. The metal star is attached with a magnet. Here is cutting board/wall pocket view number one! View of the attaching screws. In view number two, I removed the magnetic star and the Christmas greenery and added vintage kitchen utensils. This view would work year round. And in view three the wall pocket is filled with vintage cookbooks. A old photo is attached to the front of the wall pocket with a magnet. This way will also work year round. 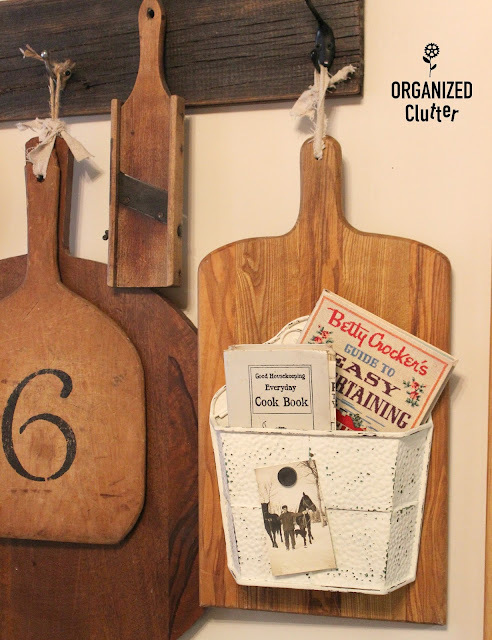 This makeover was very easy, and the end result is a fun piece for a farmhouse kitchen. Thanks for checking out my latest cutting board project! 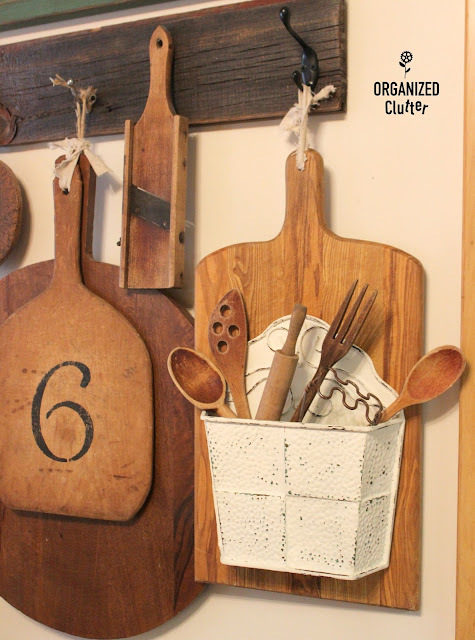 This is a fun idea, Carlene...you could use it so many ways! Such a smart idea. Love it! Simply adforable and fun. Thanks for the inspiration, Carlene. Absolutely love these ideas! I especially like the one with the star and greenery. Carlene~I ALWAYS enjoy seeing I have a new email from Organized Clutter. You amaze me, I'm trying to have that great eye for finds like you do. Great Job Again. When I got your email that said cutting board, I had to run over and look. I love my boards too. This idea is so sweet, Carlene. Thanks for sharing! Always love your posts! Thanks for the inspirational ideas. adorable! I could use one of these in the kitchen for mail! This is precious. What a great upcycle. I love it with the Christmas greens tucked in. 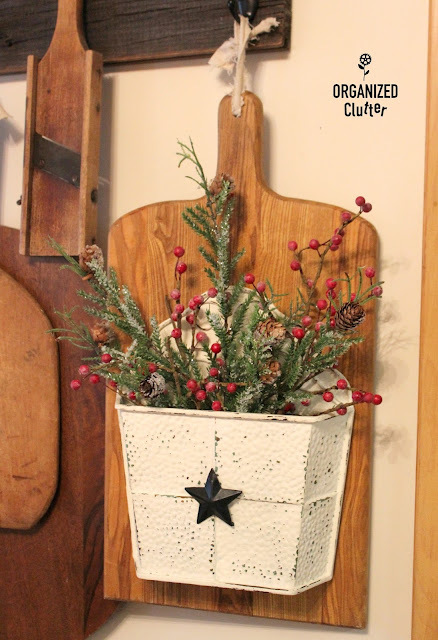 What a cute upcycle, Carlene - I really love the one styled for Christmas! Carlene--you are SO creative! I love your posts. I love how you combined the two pieces to make one whole that looks like they started out that way! Can't decide which look I like the best! How ever did you think of this?? ?